← Ron Locicero, M.S., P.T. 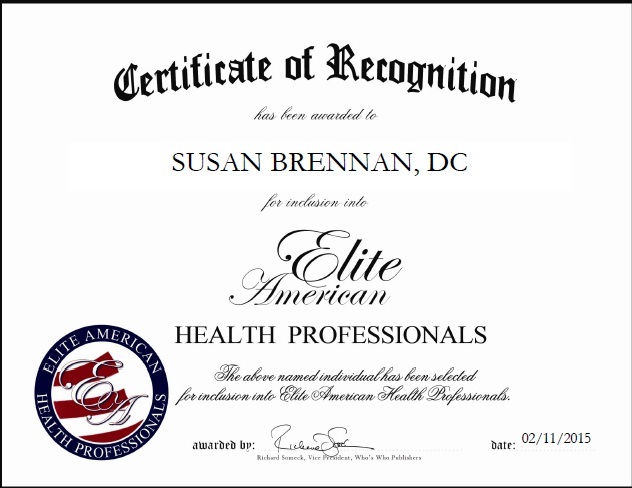 Palm Springs, CA, February 11, 2015, Susan Brennan, DC, Owner, Chriopractor and Certified Naturopath, has been recognized by Elite American Health Professionals for dedication, achievements, and leadership in naturopathic medicine. Dr. Brennan is a Chiropractor who has had her own practice in Oakland, California for the last twenty six years. Her patients range in age from seven months to well into their eighties. She believes in treating the whole person not just the symptoms. 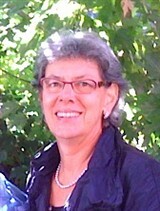 Susan is certified in Naturopathic Medicine. She teaches her patients that diet, exercise and lifestyle changes with natural therapies can help the body ward off and combat disease. Dr. Brennan suggested a diet protocol to her post menopause patients that not only made them lose weight but changed their lives for the better. It was developed by European Doctors in the late 50s. Upon reflecting on a rewarding career, she attributes her success to her ability to maintain a strong personal relationship with her patients, who are also many times her best teachers. This entry was posted in Physical Therapy, Rehabilitation and tagged chiropractor. Bookmark the permalink.